CREATIVE LATE BLOOMERS : BOOKS ON OLD AGE: HALF EMPTY OR HALF FULL? BOOKS ON OLD AGE: HALF EMPTY OR HALF FULL? What will life be like when we are really old? Old old? Will our productive days be over? Or can our creativity last or even flourish into our eighties and nineties? Two recently published books ask those questions and come up with very different pictures. 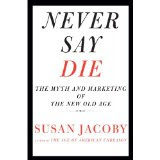 Susan Jacoby in Never Say Die: The Myth and Marketing of the New Old Age says we have not been honest with ourselves about what lies ahead for those of us who survive into ninth and tenth decades of our lives. Jacoby, who is 63, thinks we are wrong to imagine that at 65, the best years of our lives may still ahead of us. She wants us to look more realistically at what the old old have to face. "Harry R. Moody, the author of numerous books on the psychology and ethics of of aging," she writes, "came up with the terms 'wellderly' to describe the healthy old, as opposed to 'illderly.' What such distinctions do not acknowledge is that nearly all of the wellderly, if they live as long as my grandmother did, will turn into the illderly." Anyone who lives beyond eighty-five, she reports, has a 50-50 chance of ending up spending some time in a nursing home and close to a 50 percent chance of developing dementia. "We cannot continue to base our image of old age on the extraordinary person, blessed by a combination of affluence and physiological hardiness, who remains 'as sharp as a tack' and takes up a new, youthful hobby -- say, skydiving -- in her nineties," she writes. "We cannot idealize the remarkable accomplishments of a few people who maintain their creative abilities and mental acuity into advanced old age as if those accomplishments were the norm." The norm, she says, is more like the case of her grandmother, "an ordinary person with serious health problems and ordinary financial resources" who had to live out her life in a nursing home where she was "one of only a handful of residents who still had a working brain." 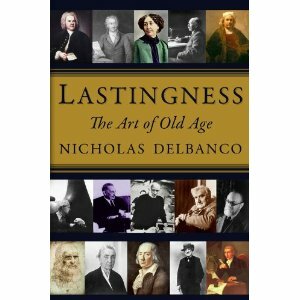 In Lastingness: The Art of Old Age, Nicholas Delbanco focuses on those extraordinary persons that Jacoby says are not the norm in order to figure out why some people do manage to stay productive into old age. He's interested in the artists -- writers, painters and musicians -- who not only continued to be creative in their old age but also did some of their best work in their "twilight years." He concentrates on artists working past age 70 (Delbanco is 68) and comes up with some fascinating stories about late-in-life achievers such as William Butler, who wrote some of his best work late in life; Claude Monet, who painted well into his 80s, even though his eyes were covered by cataracts; and Pablo Casals, who could barely make it to the podium but was transformed when he began to play his cello. Delbanco makes no sweeping judgments about creativity and old age. In fact, he never really comes up with an answer to his question of why some artists do last and some don't. But that doesn't stop him from reveling in the stories of those who do. I understand the impulses of both of these authors. Jacoby is concerned that in our rush to battle the stereotypes of ageism we are forgetting the real, material needs of many of the very old. She sees the glass of old age as half empty -- and thinks that those of us who look at it as half full do at our own peril. I agree that you can carry the idea of defying age too far -- although I was surprised to learn that half of the people who make it into their eighties and nineties never see the inside of a nursing home and more than half never experience dementia. But, no, we're not going to "beat this thing" and Jacoby is right to denounce such baby boomer delusions. Aging successfully is not for sissies. Delbanco, on the other hand, is addressing the more intangible needs we have as we grow old. The need to feel productive. The need to feel creative. The need to have hope. He doesn't exactly see the glass half full -- he admits that lasting creativity among the old old is rare -- but he prefers to examine those who defy the norm and to take from them his own inspiration. As Delbanco says, there is no intrinsic reason why people cannot continue to create late in life. They are not aspiring to be baseball players or ballerinas, professions that do have a restricted shelf life. But are Delbanco's examples of famous artists too extraordinary, as Jacoby contends, to be of value in considering what happens to "ordinary people" who survive into their eighties and nineties? Well, consider this: My mother was an ordinary woman with ordinary financial resources. She faced many serious health problems, from cancer to a stroke. Yet in her eighties she began to write with a burst of creative energy, fearless in her drive to create in the last years of her life. She began by writing her memoirs and then, at age 86, launched a monthly column in the Seniority section of a Florida newspaper. Her last column, written when she was in hospice, was a letter to her first great-grandchild whom she knew she would never see grow old. That column was filed on the day she died. She was 92. My mother knew, of course, that her writing wasn't going to forestall the inevitable. There were days when writing didn't ward off her aches and pains, both physical and spiritual. But writing gave her a renewed energy that was unmistakable. Watching my mother grow strong stronger as she tapped into her creative soul at such a late stage in her life has drawn me into these ruminations on creativity and aging. I, too, want to address questions even more puzzling than Delbanco's inquiry into the lastingness of artists. It's one thing to continue to create, but what about those who start to create late in life? Why did my mother have such a burst of creative energy so late in life? What can these creative late bloomers tell us about the quality of aging? Should everyone be encouraged to be creative late in life, the wellderly and illderly alike?